Imaging is a helpful tool for clinicians to evaluate diseases that induce chronic joint inflammation. Chronic gout is associated with changes in joint structures that may be evaluated with diverse imaging techniques. Plain radiographs show typical changes only in advanced chronic gout. Computed tomography may best evaluate bone changes, whereas magnetic resonance imaging is suitable to evaluate soft tissues, synovial membrane thickness, and inflammatory changes. Ultrasonography is a tool that may be used in the clinical setting, allowing evaluation of cartilage, soft tissues, urate crystal deposition, and synovial membrane inflammation. Also ultrasound-guided puncture may be useful for obtaining samples for crystal observation. Any of these techniques deserve some consideration for feasibility and implementation both in clinical practice and as outcome measures for clinical trials. In clinical practice they may be considered mainly for evaluating the presence and extent of crystal deposition, and structural changes that may impair function or functional outcomes, and also to monitor the response to urate-lowering therapy. Gout is a disease caused by deposition of monosodium urate (MSU) monohydrate crystals that induce not only acute episodes of inflammation, but also, in the long-term history of the disease, chronic inflammation that is associated with changes in articular and periarticular structures. Imaging may be useful to evaluate the severity of disease (measurement of structural joint changes), the extent of MSU deposition (location and magnitude of urate deposition), and the presence of chronic inflammation . In addition, as an outcome measure, imaging may allow estimation of the change of these variables during urate-lowering therapy; that is, as MSU crystals dissolute due to the long-term effect of subsaturating serum urate levels achieved during urate-lowering therapy . If so, imaging would also provide a useful tool to monitor the response to urate-lowering therapy [3, 4]. In patients with the very first manifestations of gout, no radiographic findings are present but for an increase in the soft tissues. Typical plain radiographic features of chronic gout  include visualization of tophi as soft-tissue or intraosseous masses, and the presence of a nondemineralizing erosive arthropathy with erosions that are well defined with sclerotic or overhanging margins (Figure 1a). The joint space is usually preserved until late in the disease, and other features such as periosteal new bone formation, extra-articular erosions, intraosseous calcifications (Figure 1b), joint space widening, and subchondral collapse may be present [6–8]. Radiographic abnormalities are most frequently present in the feet (Figure 1b), particularly in the first metatarsal phalangeal joint . Radiographic damage is a late feature of chronic gout, typically occurring 15 years after onset of the disease, and is virtually always present in patients with subcutaneous tophi . Oblique projections may enhance observation of small erosions (Figure 1c). Plain radiography images demonstrating bone erosions. (a) Radiography of the hand in an oblique projection demonstrating bone erosions located in metacarpal phalangeal joints and in proximal and distal interphalangeal joints. (b) Radiography of the foot in a dorsal–plantar projection showing extensive bone erosions involving the first and fifth metatarsal phalangeal joints, and proximal and distal interphalangeal joints. Typical intratophus calcifications may be seen in intraosseous tophi and in periarticular tophi. (c) Radiography of the tarsal bones in an oblique projection showing erosions in the scaphoid and first metatarsal bone, with typical overhanging edges. Soft-tissue masses due to extensive tophaceous deposition may also be observed. A recent study has identified a valid radiographic damage index in chronic gout. Such a scoring system is required for future studies to determine the impact of intensive urate-lowering on radiographic damage, and to guide therapeutic decision-making in patients with chronic gout. The gout radiographic damage index is a modified Sharp/van der Heijde scoring method of erosion and joint space narrowing, which incorporates the joints scored in the rheumatoid arthritis scoring method and the hand distal interphalangeal joints. This index was shown to be reproducible, feasible, and able to discriminate between early and late disease . This damage index has shown to be strongly associated with functional capacity . A comparison of plain radiography and computed tomography (CT) has shown very good agreement between the two methods for assessment of gouty erosions, providing further validation for the erosion component of the gout radiographic damage index . Some mismatch was evident, however, with higher radiographic erosion scores at the distal interphalangeal joints. It is probable that assessment of these joints for erosion by plain radiography may be less reliable due to their small size, and due to the presence of concurrent degenerative joint disease. CT allows excellent visualization of tophi (Figure 2). MSU crystals obtained from tophi measure around 170 Hounsfield units, and similar densities ranging from 150 to 200 Hounsfield units are measured in subcutaneous and intra-articular tophi . Use of CT may assist in differentiating tophi from other subcutaneous nodules. Gerster and colleagues have suggested that CT provides more specific images than ultrasonography or magnetic resonance imaging (MRI) for assessment of tophi . Computed tomography images demonstrating extensive tophaceous deposits. Three-dimensional volume-rendered computed tomography images of the right foot from a patient with chronic gout, demonstrating extensive tophaceous deposits (visualized as red) – particularly at the first metatarsal phalangeal joint, midfoot and Achilles tendon. (a) Dorsal view and (b) lateral view. CT has the potential to play a role in clinical assessment of chronic gout in a number of situations; in assessing complications of gout [13, 14], in guiding aspiration, in assisting with noninvasive diagnosis of subcutaneous nodules, in identification of deep intra-articular tophi, and in evaluation of bone erosion associated with gout. CT has superior capability over both plain radiography and MRI to detect bone erosion in other erosive arthropathies such as rheumatoid arthritis [14, 15]. The excellent ability of this imaging modality to image both tophus and bone erosion has provided new insights into mechanisms of joint damage in chronic gout. A systematic CT analysis of individual joints in patients with chronic gout has demonstrated a strong relationship between bone erosion and intraosseous tophus . For those joints with bone erosion on CT, 81.8% had visible intraosseous tophus, and all joints with large erosions (>7.5 mm diameter) had visible intraosseous tophus. There was also a strong correlation between the CT erosion diameter and the intraosseous tophus diameter in individual joints (r = 0.92, P < 0.0001). Intraosseous tophi were larger than nonintraosseous tophi, but had similar density and calcification, suggesting that the burden of MSU crystals within the joint, rather than particular biological characteristics of the tophus, is an important determinant of the development of associated bone erosion in gout. Direct visualization of tophi within sites of erosion strongly implicates these lesions as causative in the pathogenesis of bone erosion in gout, and provides further support for early urate-lowering therapy, in order to prevent the development of intraosseous tophi and bone erosion. A further development in CT imaging of gout is the use of dual-energy CT; a system with two X-ray tubes scanning at 80 kbp and 140 kbp. This technology has been used for compositional analysis of kidney stones and allows for colour identification of uric acid and calcium. 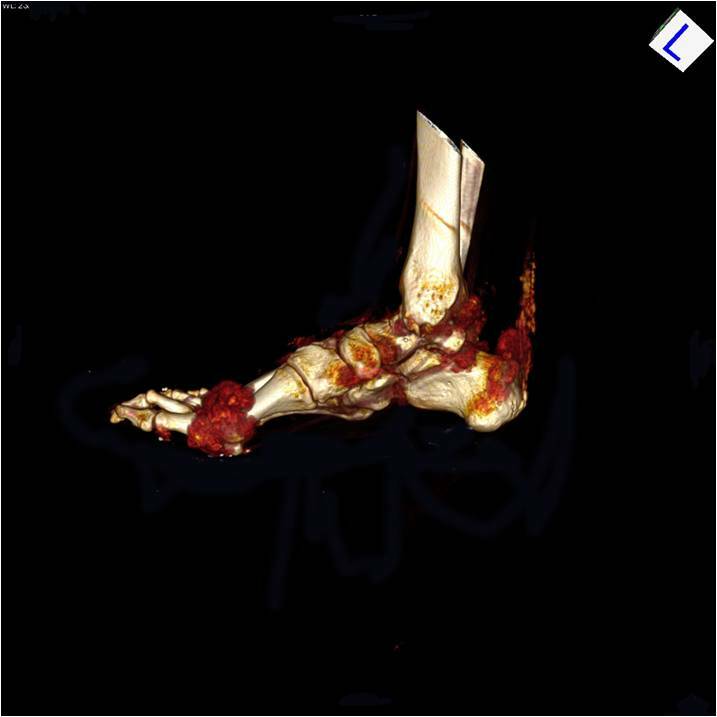 Dual-energy CT has the potential to allow noninvasive diagnosis of gout, and also measurement of total body urate burden, through three-dimensional volume assessment of tophi [15, 16]. Validation studies are now needed to confirm the specificity and reliability of this technique, particularly compared with other methods of tophus assessment. Although findings are not specific for the diagnosis of gout, MRI allows early detection of tophi and bone erosion in patients with gout . Synovial involvement may also be appropriately evaluated with MRI . The relative lack of specificity of MRI and the technique's high cost, however, limit its role in routine clinical assessment of gout. Chronic tophaceous gout often presents as juxtarticular soft-tissue masses, sharply defined erosions, overhanging margin bone, and thickening of the synovium. Tophi have variable signal intensity on T2-weighted images (Figure 3a). The most common pattern is heterogeneous intermediate to low signal intensity on T2-weighted images. Both the synovial membrane and tophi can show intense gadolinium enhancement, reflecting granulation tissue and increased vascularization. T2-weighted magnetic resonance imaging scans. 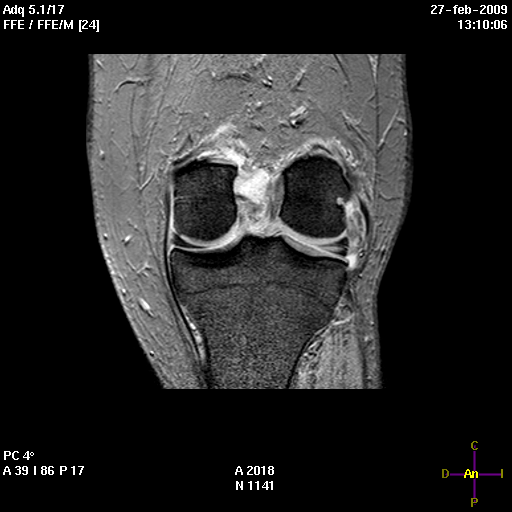 (a) Coronal gradient echo T2-weighted magnetic resonance imaging (MRI): two nodular images with an intermediate signal (tophi) under the external collateral ligament and inside the posterior cruciate ligament of the knee. An external meniscus tear may be seen close to urate deposition. (b) Axial T2-weighted MRI: low signal intensity of both tophi, and marked hypointensity of synovium in a Baker cyst. (c) Axial post-contrast (gadolinium) T1-weighted MRI: thickening and nodular enhancement of the synovium in the suprapatelar recess. Typically, tophi have homogeneous low signal intensity on T1-weighted spin-echo images but variable signal intensity on T2-weighted images. Peripheral enhancement of tophi following intravenous gadolinium has also been reported , but peripheral enhancement made it difficult to obtain proper imaging of tophi in one study . In joints affected by tophi, synovial thickening (Figure 3b), effusions and bone erosion may be present, with bone marrow oedema adjacent to tophi [17, 19, 21]. MRI studies have has also shown that urate deposits spread along compartmental and fascial planes, rather than in a radial pattern . The synovial membrane is generally too thin to be shown by MRI. The membrane becomes visible when it is pathologically thickened. In patients with chronic gout a variable signal intensity pattern may be observed, but most of the time the membrane shows intermediate to low signal intensity on T2-weighted images (Figure 3c). 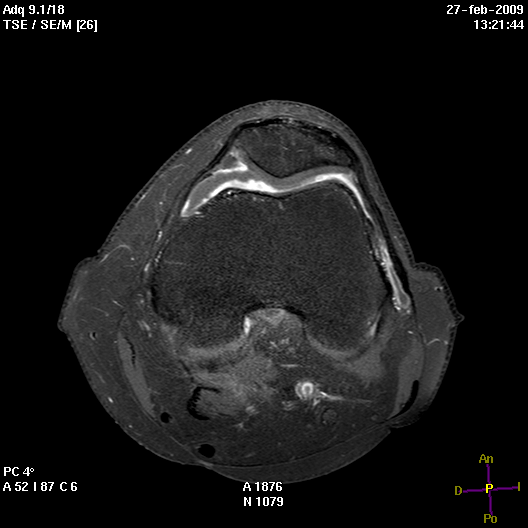 Multiple conditions may illustrate hypointense synovial lesions on T2-weighted images. Classically pigmented villonodular synovitis presents as localized or diffuse proliferative hypointense lesions. Other conditions such as haemophilic arthropathy, amyloid arthropathy, synovial chondromatosis, and long-standing rheumatoid arthritis , and even other granulomatous diseases such as tuberculosis and fungal infections, may show similar findings . MRI may have a particular clinical role in identifying complications of gout. 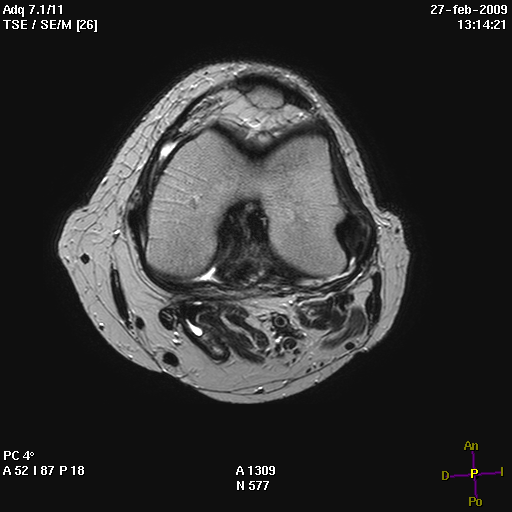 In a series of patients showing unexplained limitation of the knee joint, MRI was useful to evaluate tophaceous urate deposition as the cause of such limitation . Over the past several years there has been growing interest in ultrasonography (US) in rheumatology [23–25]. Advantages of using US include the lack of radiation, the low cost (compared with MRI and CT), the repeatability, the patient friendliness, the multiplanar imaging capability, the high resolution, the dynamic assessment, and its efficacy as a method of guidance for gold-standard diagnostic procedures for gout, such as synovial fluid and tophi aspiration. The physics of US make it an ideal tool to detect crystalline material in soft tissues. US has long been used to detect calcified gallstones and renal stones. The technique visualizes tissues as acoustic reflections. Crystalline material found in gouty joints reflects ultrasound waves more strongly than surrounding tissues such as unmineralized hyaline cartilage or synovial fluid, and can thus be readily distinguished. The impact of US has been recently highlighted in patients with asymptomatic hyperuricemia . Small tophaceous deposits were found in 12 (34%) of these patients, and an increased power-Doppler signal was observed in eight (23%) patients, suggesting onsite inflammation. This study using US is the first to link the gap between asymptomatic hyperuricemia and symptomatic deposition of urate, namely gout. Could we call this stage asymptomatic deposition of urate or asymptomatic gout? Imaging showing crystal deposition and inflammation may support starting urate-lowering therapy, especially in view of recent reports suggesting that gout may be a better predictor of cardiovascular outcomes than hyperuricemia [27, 28]. Comparison of high-resolution US with conventional X-ray imaging in the metatarsal phalangeal joints of gouty patients found changes suggesting gout in 22 metatarsal phalangeal joints in patients with gout who had never been subjected to an attack of acute gout . Erosions were detected three times more frequently by high-resolution US than on X-ray imaging. In this study, US aided in the diagnosis of gout by identifying sonographic features suggestive of gout in clinically silent joints. Another study compared US with conventional radiography . The hand, finger, and toe joints of 19 patients with acute and chronic gout were examined with grey-scale and power-Doppler US. The US technique was found to be superior to conventional radiographs in evaluating small bone changes. The authors suggest that power-Doppler US can differentiate active from inactive, noninflamed fibrotic synovial tissue and that inflammation in gouty joints is better detected with power-Doppler US than with clinical examination . In another study comparing high-resolution US with conventional radiography, the authors found conventional radiography to have a sensitivity of 31% (32/102) and a specificity of 93% (55/59) in showing features of gout, versus US that had a sensitivity of 96% (98/102) and a specificity of 73% (43/59) in showing features of gout . The authors' conclusion was that US was much more sensitive than conventional X-ray imaging but was less specific. Several patterns of US have been reported in patients with gout (Table 1). The most useful elemental lesion is the double-contour sign – a hyperechoic, irregular band over the superficial margin of the joint cartilage, produced by deposition of MSU crystals on the surface of the hyaline cartilage, which increases the interface of the cartilage surface, reaching a thickness similar to the subchondral bone (Figure 4a). In a study of US pictures obtained from 60 patients with a crystal-proven diagnosis (34 patients with calcium pyrophosphate dihydrate crystal deposition disease and 26 patients with MSU crystal-proven gout), MSU crystal deposition was found on the surface of articular cartilage . The double contour sign was only found in patients with gout . Ultrasonography patterns indicating the presence of gout. (a) Double contour sign: transversal ultrasound imaging of the knee joint in the anterior intercondile area. The double contour image is shown as an anechoic line paralleling bony contour femoral cartilage. B-mode, linear transducers with a frequency of 9 MHz. C, knee condyles. 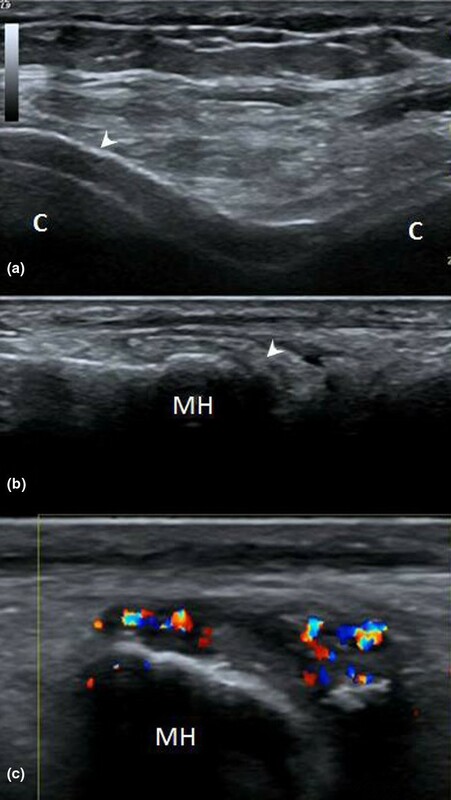 (b) Hyperechoic images: longitudinal ultrasound imaging of the dorsal aspect of the first metatarsal phalangeal joint. The hyperechoic cloudy area represents monosodium urate deposits within the thickened synovial membrane (arrows). B-mode, linear transducers with a frequency of 9 MHz. MH, metatarsal head. (c) Power-Doppler signal: longitudinal view, dorsal aspect of an asymptomatic first metatarsal phalangeal joints. The Doppler signal may be seen even seen in hyperechoic synovial areas. Transducer with a frequency of 14 MHz in grey scale and colour Doppler with a frequency of 7.5 MHz. In contrast to gout, calcium pyrophosphate crystals tend to aggregate in the middle layer of the hyaline cartilage, parallel to the bony cortex, as a hyperechoic, irregular line embedded in the anechoic-appearing hyaline cartilage, with a normal hyaline cartilage surface . Chondrocalcinosis can thus be readily distinguished from gout. Another useful ultrasound sign is the presence of hyperechoic cloudy areas in the synovial joint (Figure 4b). The synovial sheath and soft tissue have 79% sensitivity and 95% specificity . Bright dotted foci and hyperechoic stippled aggregates have 80% sensitivity and 75% specificity. The presence of bright stippled foci and/or hyperechoic areas on US indicated gout with great sensitivity (96%), whereas the specificity is limited (73%). Bone erosions defined by US are defined as breaks in the hyperechoic bone profile detectable in two perpendicular planes. Ultrasound has proven to be three times more sensitive than plain films in the detection of bone erosions <2 mm (P < 0.001) . Another aspect of the use of US was to measure tophi. A recent study compared the use of MRI with US in evaluating intraarticular and articular tophi . US detected at least one tophus in all joints where MRI found nodules considered to be tophi. Aspiration of nodules suspected as tophi found MSU crystals in 83%. The study found good correlation, but only fair agreement, between US and MRI. There is preliminary evidence to date suggesting that power-Doppler US may be able to differentiate active, inflamed synovium from inactive, noninflamed synovium. Recent reports have shown that the power-Doppler signal is present in acutely inflamed joints from gout patients, and that the power-Doppler signal disappears with treatment , which suggests that power-Doppler US could be a useful method to monitor gouty synovitis (Figure 4c). Interestingly, other authors have observed that the power-Doppler signal was even present in asymptomatic joints from gout patients  and in asymptomatic hyperuricemia . Truth, Discrimination (which includes reliability and sensitivity to change), and Feasibility are the cornerstones of the OMERACT filter for outcome measures in clinical trials. Although specifically designed for outcome measures in clinical trials, outcome measures may be implemented – once one considers that they were developed specifically for clinical trials – in clinical practice, as occurred for the Disease Activity Score for rheumatoid arthritis. A modified Sharp/van der Heijde method was compared with the Ratinger destruction score and the Steinbrocker score to determine the scoring method that best reflected radiographic changes in chronic gout. The Sharp/van der Heijde erosion score and the Sharp/van der Heijde joint space narrowing score independently contributed to the consensus global score, but agreement was better between the consensus global score and the adjusted Sharp/van der Heijde erosion plus narrowing score. The authors observed that most reproducible method was the modified Sharp/van der Heijde method and that it also best discriminated patients with longstanding or tophaceous gout . The previous study did not evaluate sensitivity to change. In a study of 2,000 patients with gout, two or more radiographs of the same joint were available in 80 patients at intervals ranging from 3 to 29 years . Radiologic improvement was observed in only 21 (26%) patients and progressive deterioration was observed in 41 (51%) cases. Improvement was only related to soft-tissue swelling, cortical intraosseous erosions, and lytic lesions, but narrowing of the joint space was observed to be irreversible. In another study of 39 patients at 10-year follow-up, radiographic improvement was observed in eight cases (20%), 22 (57%) cases were unchanged, and nine (23%) patients showed progression of radiographic findings . Interestingly, 1/14 (7%) patients of a group with no radiographic involvement at entrance and an average serum urate during follow-up of 6.2 mg/dl showed radiographic progression, while 3/11 (27%) patients of a group with previous radiographic involvement but no subcutaneous tophus and an average serum urate during follow-up of 6.5 mg/dl showed progression, and 5/14 (36%) patients of a group with both radiographic and tophaceous involvement at entrance and an average serum urate during follow-up of 7.1 mg/dl showed progression. Limitations to these studies are that none of them defined improvement or studied variability in the reading of radiographs, the number of patients was small, and proper control of urate was not achieved in more than one-half of the patients. The MSU (tophus) deposition measurement was included in the core set of outcome measures of OMERACT7. Measurement of subcutaneous tophi using a metric belt was shown to be highly variable, contrary to the measurement using a calibrated calliper that was shown to be as reliable as CT . Both methods have been shown sensitive to change during urate-lowering therapy, but the smallest detectable difference is high for the metric belt and has not been tested in a short-term study. Three studies designed to validate the measurement of tophi with imaging techniques have been recently published [20, 34, 38]. The development of advanced three-dimensional modelling and volume assessment now allows CT technology to be used to accurately analyse the size of tophaceous nodules. The reliability of CT measurement of the subcutaneous tophus volume was compared with physical measurement of the tophus size using a calibrated calliper . CT measurement of the tophus volume was shown to be highly reliable and reproducible. There was no difference in reproducibility, however, between CT and physical measurement with a calliper. Furthermore, for tophi identified by physical and CT assessment, there was excellent correlation between measurements. Therefore, although CT assessment of the subcutaneous tophus volume is reliable and reproducible, physical measurement correlates well with CT, has equivalent reproducibility, and is much more feasible. MRI assessment of tophus was also studied, showing good intrareader reproducibility using unenhanced spin-echo images . The smallest detectable difference was close to 25% of the volume measurement. A small but statistically significant difference in the inter-reader mean tophus volume was detected. The sensitivity to change of this method has not yet been assessed. US hardware is more easily available than that for CT and MRI, and therefore US is considered the most feasible, nonradiating, and least expensive imaging technique. To evaluate US as an outcome measure with face validity, US-guided puncture of articular nodules suspected to be tophi yielded 83% of positive results for MSU crystals . US was also compared with MRI, showing good correlation but showing modest agreement for measurement. Volume measurement reproducibility was good for both intraobserver and interobserver correlations. Sensitivity to change was also tested at 12-month follow-up on urate-lowering therapy. In patients showing serum urate levels <6 mg/dl, 19/28 (68%) tophi showed a reduction over that of the smallest detectable difference, while only 1/10 (10%) of tophi in patients with serum urate levels >6 mg/dl showed a significant reduction. Furthermore, there was an inverse correlation between the reduction in both diameters and volume and the average serum urate levels during urate-lowering therapy. Plain radiographs are less sensitive to early changes in chronic gout than other imaging techniques. The presence of structural changes in radiographs correlates with poor function, and is associated with irreversibility of changes. CT may be the most specific imaging technique when evaluating intraosseous lesions, while MRI could be the preferred technique to evaluate chronic synovial involvement. High-resolution US may show very early deposition of urate crystals and may also evaluate synovial thickening and inflammation, although more studies are needed. US is the only imaging technique that has been fully validated for tophi measurement, but further studies must confirm this issue. This review is part of a series on Gout edited by Alex So. FP-R serves on the advisory board for Ipsen, Savient, Pfizer, Ardea and as a consultant to Ipsen. NS serves on the advisory board for Savient, Takeda, Novartis; has received grants and served as a consultant to Novartis, and is on the speakers' bureau for Takeda. ND, EdM and AS declare that they have no competing interests.